ORLANDO (May 26, 2018) – More than 30 pro watersports athletes ditched their wakeboards and waterskis on May 23, 2018 for a head-to-head battle to see who could endure the blazing ring of fire the longest at Feet on Fire South. The barefoot endurance contest took place at The Waterfront restaurant on Lake Jennie Jewel in Orlando, and is traditionally one of the most anticipated contests among both competitors and spectators alike. Two barefooters compete behind the boat at one time, with both having to be off their step ski and on their bare feet by the starting point. From there, the boat continues in a large circle pattern, or Ring of Fire, until someone falls. The last person standing, without falling, advances to the next round. But, unlike most endurance barefoot contests, Feet on Fire has one distinctive and important rule: no barefoot suits allowed, only a pair of shorts and a flotation device. Feet on Fire South was comprised of an invite-only list of elite athletes from a broad spectrum of towed watersports, including wakeboarders, wakeskaters, traditional waterskiers, show skiers, stunt men and industry veterans, as well as five athletes who earned their spots in the competition during a qualifier event on May 22. Now a three-time Feet on Fire champion, pro wakeboarder and Nautique athlete JD Webb took home first place, followed by two-time Feet on Fire champion and one of the founders of the “#PassTheHandle” initiative Zane Schwenk. The two gave spectators a thrilling final battle with more than four laps around the lake and tons of close calls as both competitors nearly caught a toe multiple times. This heated match-up also earned them the PCM Engines Longest Battle Endurance Award (average number of laps in the contest was just over two) for the most laps around Lake Jennie Jewel. Webb worked hard for the Feet on Fire South title, with four of the five longest runs of the day – totaling nearly 13 laps around the lake. He also had the most jarring and spectacular slam of the competition, when the rope from Chip Fernandez immediately took him out by his feet, causing him to crash out the front during round two. This earned him the SeaDek Best Crash of the Day Award. The Feet on Fire Best Kick Of The Day was awarded to Footin.com and World Barefoot Center (WBC) ambassador and industry videographer Jake Snider, after completing a step off to styled out one-footer, holding solid all the way into the first turn of the circle of fire. 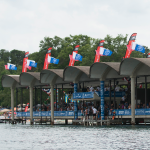 The SeaDek Most Impressive Performance of the Day Award was presented to waterski Hall of Famer Tom Weber, who in his rookie Feet on Fire performance made a total of just over four full laps and was taken out by Anderson in the quarter finals. Weber was the most mature barefooter on the water with more than five decades of barefooting and waterskiing experience. “These days it’s rare to see all of wakeboarding’s original legends in the same place, at the same time – Scott Byerly, Parks Bonifay, Shaun Murray, Darin Shapiro, Cobe Mikacich, Zane Schwenk and more. Harley Clifford even took the opportunity to snap a pic with his heroes,” said Kevin “Kevco” Michael, executive director of the Water Sports Industry Association (WSIA) and competitor at Feet on Fire South. Hall of Famer and barefoot legend Ron Scarpa made his first public performance in over a decade to open Feet on Fire South with an honorary lap around the lake that ended with his classic, signature dismount back to shore. The biggest upset of the day was when Anderson took out pro wakeboarder Pierce Homsey, during the second round. Homsey had tied for third place at the 2017 Feet on Fire competition. During his match-up with Anderson, he missed his footing on his step off, causing him to fall straight out of the gate – giving Anderson an easy ticket to round three. The two current best endurance barefooters in the world were part of the double main event that followed the Feet on Fire South final. Seventeen-time National Champion and 13-time World Champion, Keith St. Onge, and one of the all-time greatest endurance barefooters, Pete Fleck, were joined by James (JJ) Link and Logan Walter in a first-ever four-man Super Final Endurance Drag Race. Regal & Nautique of Orlando provided a brand new Nautique 200, powered by PCM Engines, to pull the event. Other athletes who competed include: Shane Bonifay, Erik Ruck, Danny (Dano the Mano) Amir, Jake Pelot, Danny Harf, Curtis Rabe, Jake Ramsdell, Brannon Meek, Cody Hesse, Jeff Teunissen, Joey Bradley, Dan Olson, Tom Oka, Scott Hussey, Joey Blakely, James Ort, Derek LeBlanc, Evan Done and Mike Dehlinger. Feet on Fire has never been about winning money; it is more about bragging rights and a sick custom trophy made by Drew McGuckin. This year’s Feet on Fire South prizes also included: four half day passes to barefoot with St. Onge at the World Barefoot Center, custom Feet on Fire step off skis and disc, custom Feet on Fire South leaderboard created by Tony Fasen of Fazen Arts, custom awards crafted by SeaDek and a PTM Edge high-definition mirror, among other prizes.